Today’s Throwback Thursday takes me back to a racetrack I haven’t thought of in years, and couldn’t even remember the name of. But what a fun event – sometime in the summer of 1980. This was an unusual autocross, something I haven’t seen since. There was a day portion for practice, followed a night autocross. Hence the big lights: the track was pitch black! Great fun! The track itself was an extra-large go-cart track event at Cherry Valley Motorsports Park in central New York state. It had plenty of room for an auto-x, although there weren’t any cones. And the speed was much higher than a parking lot-type autocross. And it wasn’t an SCCA event – they wouldn’t have sanctioned a night event. One fence separated the “pits” from the track. I don’t remember much about the competitors, other than Rita’s cheating Trans Am (a constant irritant until they finally caught her) and a sorry little 289 (real) Cobra. Speaking of my Mustang Cobra, I remember doing well. I had a problem with the lights moving slightly in their mounts (you can see it above in the pictures). 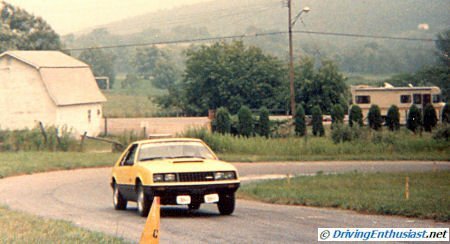 But, despite not having any power to speak of, the car handled well, was reasonably balanced, and made for a reasonable auto-x car. The biggest issue was the absurdly awful seats – low-back buckets shared with the Ghia model (there were three seats available in ’79). I literally couldn’t sit in them, they didn’t recline, and my helmet hit the roof. And then there was the 250 mile drive home at 2 AM. Not fun, but a great day overall.